Mailbag #3: Outfield scenarios, platoon splits, a future manager? An off-day mailbag! Because we’ve (I’ve) been slacking on mailbags. Let’s get started with an optimistic question! This is entirely possible, which is the worrying part for me. The immediate future will still be Carl Crawford in left, Andre Ethier in center, and Yasiel Puig in right. Hopefully with Scott Van Slyke platooning with Crawford against lefties (prefer Ethier but somebody has to play center). So hardly any change there from last year, but the team would lose the All-Star upside in Matt Kemp. 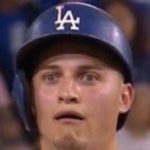 Eventually though, I do think they would try to get Joc Pederson playing time to figure out: 1) if he can hit in the MLB 2) if he can play center. Depending on how he answers that, they would look to trade Crawford or Ethier within a couple years. That’s not a horrible outfield the Dodgers would be left with, but it would cost like $70 million and have only one outfielder with All-Star potential in Puig — the lowest paid of the bunch. So being stuck with that potential mediocre future is certainly a reason to root for a successful Kemp comeback, as he’s the only other outfielder with the potential to still be a star. For hitters like Ethier and Crawford, their future splits are basically what they currently are in terms of skill. There’s no sample size issue and there’s no real reason to hope every year that they might’ve magically learned something. They’ve played enough where platoon splits generally stabilize, and going by the eye test, I certainly haven’t seen any difference. With guys like Pederson though, there’s hope. Besides the statistical argument, I don’t think he’s that far off mechanically. While he doesn’t get as consistently good cuts against lefties yet, he’ll stay closed and take a rip, which is different from guys like Ethier who look lost on every breaking ball down from a lefty. So yes, there’s hope for Joc, but whether he improves or not will be a matter of seeing more lefties and making the correct adjustments, which is hard to predict. As it stands, a .969 OPS against righties and a .711 OPS against lefties is reason to be concerned, and it’s worth monitoring his progress going forward. Somewhat ugly in the immediate future. That would leave an aging Juan Uribe to start at third, and looking internally, the team could plug in either Miguel Rojas or Erisbel Arruebarruena at short. Yikes. On the free agent market, though, they could pursue J.J. Hardy, Jed Lowrie, or Asdrubal Cabrera. I suppose Hardy wouldn’t be a bad option, assuming he puts up a solid 2014, but there’s probably still going to be at least a one or two win drop-off from Hanley if they both perform as expected. In the future, the Dodgers have Corey Seager to move to third, assuming nothing goes wrong with his development. At short, it’s basically Arruebarruena or bust. I have to assume they would sign somebody (like Hardy) long-term or make a trade if they don’t have confidence in Erisbel, because there’s nobody behind him at the moment. So you can see why I was advocating to just extend Hanley already. Any future without Hanley is not going to look as good as it could potentially be with him in the fold. Not really, no. Every first base prospect with the potential to be a regular has extreme risk attached to them, including Chigbogu. Scavuzzo doesn’t project at first, because at worst he’ll play left field. Plenty athletic for that position. I would say Cody Bellinger fits the mold best though. He plays the same slick defense and projects to rate as plus (maybe plus-plus) at first. He also has a sweet stroke, but whether the power will come down the road or not is still up in the air. I don’t like his swing at all and I don’t think he’ll be able to hit. Even if his swing gets more efficient I just don’t think the bat speed is there, much like I feel about Drew Butera. Rojas hasn’t proven anybody wrong yet in his minor-league career, though maybe he could become a utility guy because his defense is legit even if he fumbled a few in Spring Training. I mean, if Butera can get an MLB job with the state of his bat, I suppose anything is possible. Would be surprised if he manages to carve out a utility role in the MLB, but I think he serves his purpose as organizational depth because of his defense. Has to be A.J. Ellis, right? Seems like the obvious choice to me. By like 2020? The Brad Ausmus career path? Two guys who I would LIKE to see be a manager: Yasiel Puig and Zack Greinke. Puig … for obvious reasons. What amazing, elite upside for a complete mess that would be. Then again, Raul Mondesi is a mayor now, so truly anything is possible with age. Greinke because the media sessions would be comedy gold every single day. I’ve gotten at least like a half dozen questions along these lines, and I really don’t get it. I think beanball wars are inherently pointless, but I’m not delusional, and I get WHY the Dodgers felt the need to retaliate at times last year. Simply letting stuff go doesn’t fly in dugouts/clubhouses, as it’s not how they “play the game”. So the stupidity of all the fronting aside, I understand it has to happen. That said, connecting the ability to throw a ball at another player to winning or toughness or anything of the sort is absurd. How did playing the tough guy work out for the Padres or the D-Backs last year? Hell, even the Cardinals? What they need to do is stay healthy and and catch a bit of luck in the playoffs. Like Butera hitting seven homers in the postseason or something. Without any sarcasm whatsoever, I truly thank you for allowing me the chance to use this GIF in a mailbag. I love you. Next A.J. Ellis to have surgery on left knee for meniscus tear, what now?